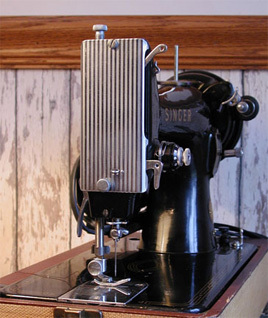 This little Singer Model 99- is a 3/4-size sewing machine. We purchased it at an antique store in New York during November 2007. The paint and decals on this machine are in exceptional quality showing little sign of wear. We have a Model 99 which is a handcrank version which is much different from this one. Most notable differences are in the handwheel and decals. 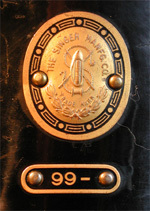 Decal detail can be seen on the banner at the top of this page. Because of their small size and lighter weight, the 99s are great for taking your quilting projects onto the road with you. It will do anything a Featherweight will do and at a fraction of the cost. However, we hasten to point out that our stitches at this time are less than perfect, but think we can improve the stitch quality after the bobbin case is replaced and both thread tensions are properly adjusted. Our stitches show a very slight zzz thing happening. The upper thread tension system appears somewhat primitive when compared to other machines but this tensioning method has been around longer than this writer. 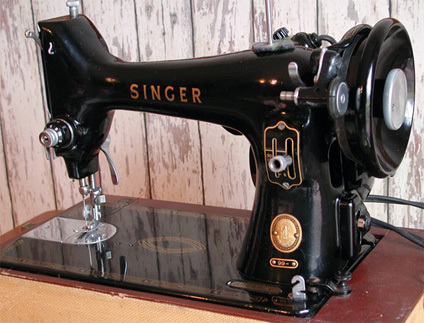 Our Model 99- makes a lockstitch sewing forward and in reverse. it only does a straight stitch (no zig-zag). Wiring on our machine is in very good shape and we suspect that someone replaced it recently. Our machine has a striated faceplates. There are certainly fancier faceplates than on this model. Compare this plate to the beautiful workmanship on the plate of our handcrank Model 99--no comparison. 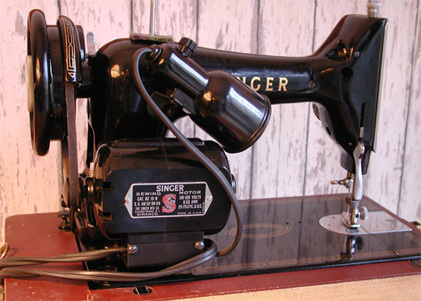 The Model 99- machine is easy to thread and the bobbin is easily accessible. We don't have a manual for the machine, but threading and bobbin winding and installation is similar to other machines. Our bobbin case has some problems and we need to replace it. However we were able to sew a fair stitch as it is. Jim finally figured out how to remove slide-plates! They are removed by first lifting the presser foot, raising the needle, and then sliding the plate to the RIGHT over the feed dogs. it comes right off. The plate is reinstalled in reverse order--sliding the plate from right to left. 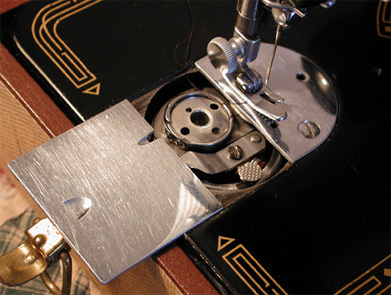 The slide-plate must be removed before the bobbin case can be removed. Since it isn't obvious how to remove the plates, we suspect that is why many of the machines never get a good cleaning in this area. Also, if you forcibly remove the plate, it isn't obvious how to reinstall it and this probably accounts for many missing plates. We are using Schmetz Universal 15x1 needles. According to an e-mail from Singer, a machine having serial number AM050607 was manufactured on April 18 1955 in Elizabeth, New Jersey. The Singer Company website indicated 25,000 AM prefix numbers were allocated April 18, 1955. Go figure.